We’ve all seen them: those short Facebook videos with text-overlays that gets millions and millions of views. They’re optimized for Facebook’s algorithm, and they go crazy viral. And they look super-simple to create. They’re short, with standard text-overlays, stock audio, and pre-made gifs and clips. Companies like Futurism build their entire social presence around them. Yet, most of these companies are using old, expensive, slow tools to make these videos. I know for a fact that Futurism builds videos for its millions of followers using Apple’s Final Cut Pro X. It looks like that’s about to change though, thanks to a tool I discovered by chance in an Uber to YCombinator’s Startup School. It’s called Commaful, and it bring the time it takes to produce viral Facebook videos from hours to 7-10 minutes, and the cost down to zero. I started the clock, and got to work. With limited time to decide on a design, or choose images, I decided to make a little advertisement for Unsplash.com, my favorite site for getting free stock photos. I dove into the tool, and created a 33-second video in 7 minutes. I did it all from a web browser on a not-very-powerful Chromebook. No fancy software, no professional training, and no hours of production time necessary. All it took was one tool, some typing, and some clicking (to choose photos and move to the next slide). Commaful’s video-creation tool is simple to a fault. The text is automatically laid-out onto each “slide” or scene of your video. There are no font-size or font-color options for now (according to the company, these options are available to influencers on a case-by-case-basis, and will be available site-wide early next year). Choosing a background from Commaful’s sizeable collection of free gifs and images takes one click. Uploading your own is also super-simple. Creating, deleting, and re-ordering slides is effortless as well. The most advanced feature in the entire site is its export options. With three clicks I downloaded a facebook-optimized, auto-paced video of my 7-minute creation. Commaful also offers an instagram-optimized version of your video which can be created with the same three clicks. Commaful also hosts an interactive version of your video which you can share to Facebook, Twitter, and Tumblr with just a few clicks. 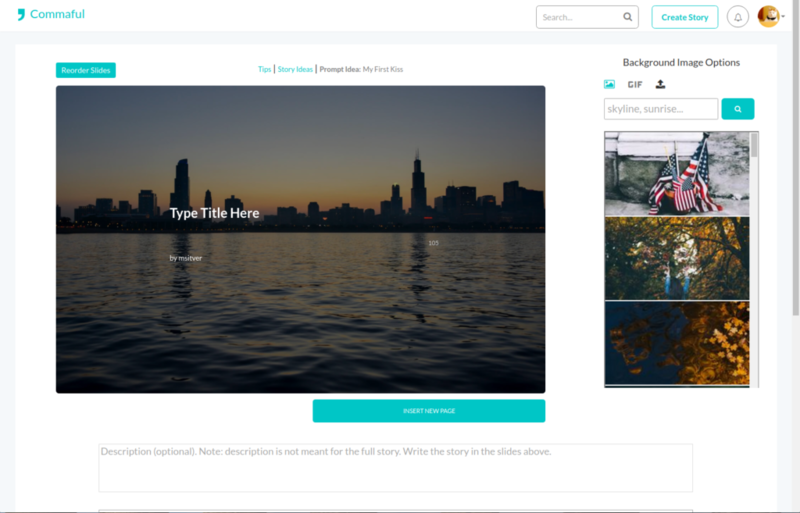 Professional marketers and content creators might need to work with the company to publish unbranded videos right now, but silent caption videos are on the rise all over the web, and Commaful might just be the tool that makes producing one accessible to all. Can We Really Trust Web Hosting Companies?